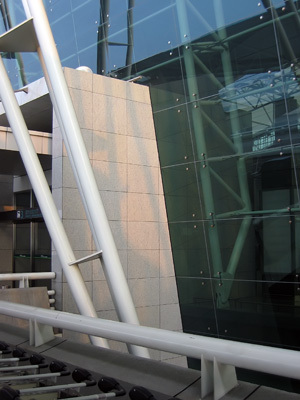 StonePly® is a fabricated stone panel wall system utilizing a composite panel made by laminating a natural stone layer to an aluminum honeycomb substrate with aviation epoxies. StonePly Honeycomb® is fabricated and then attached to the substrate with a series of aluminum extrusions. The three basic attachment methods for StonePly® are the Z clip system, utilizing one piece z-clip aluminum extrusions, the plate and screw system, utilizing concealed screw attachment and the adhesive attachment system, utilizing structural silicone. Two joint systems are available, the sealant joint, which uses backer rod and silicone, and the Rain screen system which utilizes open, 'dry' joints. Strong. 60 times the impact strength of 3 cm. granite. Choice of any granite, marble, or other stone from anywhere in the world. Bond has been tested at a wind load capacity of over 400 psf. Will not warp like many 3cm stones. Real world tested for over 25 years. As a high end, high quality stone cladding system, StonePly® is designed for use as an exterior cladding on walls, soffits, canopies, fascia, cornices and accent bands. StonePly® is typically used on lowrise to high rise buildings, such as hotels, office towers, retail complexes, condos, educational buildings, medical facilities, etc.